Hydrochlorothiazide (HCTZ or HCT) is a diuretic medication often used to treat high blood pressure and swelling due to fluid build up. Other uses include diabetes insipidus, renal tubular acidosis, and to decrease the risk of kidney stones in those with a high calcium level in the urine. For high blood pressure it is sometimes considered as a first-line treatment, although chlorthalidone is more effective with a similar rate of adverse effects. HCTZ is taken by mouth and may be combined with other blood pressure medications as a single pill to increase effectiveness. Potential side effects include poor kidney function, electrolyte imbalances including low blood potassium and less commonly low blood sodium, gout, high blood sugar, and feeling lightheaded with standing. While allergies to HCTZ are reported to occur more often in those with allergies to sulfa drugs, this association is not well supported. It may be used during pregnancy, but it is not a first-line medication in this group. It is in the thiazide medication class and acts by decreasing the kidneys' ability to retain water. This initially reduces blood volume, decreasing blood return to the heart and thus cardiac output. It is believed to lower peripheral vascular resistance in the long run. Two companies, Merck and Ciba, state they discovered the medication which became commercially available in 1959. It is on the World Health Organization's List of Essential Medicines, which lists the most effective and safe medicines needed in a health system. It is available as a generic drug and is relatively affordable. In 2016, it was the 12th most prescribed medication in the United States, with more than 43 million prescriptions. Most of the research supporting the use of thiazide diuretics in hypertension was done using chlorthalidone, a different medication in the same class. Hydrochlorothiazide is less effective than chlortalidone for lowering blood pressure but the two medications have similar effects on lowering potassium. The thiazide-type diuretics (including hydrochlorothiazide) are less effective than the thiazide-like diuretics (chlortalidone and indapamide) for reducing the risk of heart attack, stroke, and heart failure in persons with high blood pressure and the thiazide-like and thiazide-type diuretics have similar rates of adverse effects. Hydrochlorothiazide is also sometimes used to prevent osteopenia and for treatment of hypoparathyroidism, hypercalciuria, Dent's disease, and Ménière's disease. For diabetes insipidus, the effect of thiazide diuretics is presumably mediated by a hypovolemia-induced increase in proximal sodium and water reabsorption, thereby diminishing water delivery to the ADH-sensitive sites in the collecting tubules and increasing the urine osmolality. Hydrochlorothiazide belongs to thiazide class of diuretics. It reduces blood volume by acting on the kidneys to reduce sodium (Na+) reabsorption in the distal convoluted tubule. The major site of action in the nephron appears on an electroneutral NaCl co-transporter by competing for the chloride site on the transporter. By impairing Na+ transport in the distal convoluted tubule, hydrochlorothiazide induces a natriuresis and concomitant water loss. Thiazides increase the reabsorption of calcium in this segment in a manner unrelated to sodium transport. Additionally, by other mechanisms, HCTZ is believed to lower peripheral vascular resistance. ACE inhibitors — e.g. Prinzide or Zestoretic (with lisinopril), Co-Renitec (with enalapril), Capozide (with captopril), Accuretic (with quinapril), Monopril HCT (with fosinopril), Lotensin HCT (with benazepril), etc. Angiotensin receptor blockers — e.g. 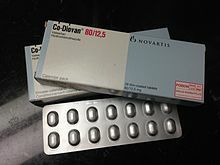 Hyzaar (with losartan), Co-Diovan or Diovan HCT (with valsartan), Teveten Plus (with eprosartan), Avalide or CoAprovel (with irbesartan), Atacand HCT or Atacand Plus (with candesartan), etc. Beta blockers — e.g. Ziac or Lodoz (with bisoprolol), Nebilet Plus or Nebilet HCT (with nebivolol), Dutoprol or Lopressor HCT (with metoprolol), etc. ^ Beermann B, Groschinsky-Grind M, Rosén A (1976). "Absorption, metabolism, and excretion of hydrochlorothiazide". Clin Pharmacol Ther. 19 (5 (Pt 1)): 531–37. doi:10.1002/cpt1976195part1531. ^ a b c d e f g h i j k "Hydrochlorothiazide". The American Society of Health-System Pharmacists. Archived from the original on 2017-05-10. Retrieved 2016-11-30. ^ Wright, JM; Musini, VM; Gill, R (18 April 2018). "First-line drugs for hypertension". The Cochrane Database of Systematic Reviews. 4: CD001841. doi:10.1002/14651858.CD001841.pub3. PMID 29667175. ^ Vongpatanasin W (July 2015). "Hydrochlorothiazide is not the most useful nor versatile thiazide diuretic". Curr. Opin. Cardiol. 30 (4): 361–5. doi:10.1097/HCO.0000000000000178. PMC 4460599. PMID 26049382. ^ Roush GC, Buddharaju V, Ernst ME (July 2013). "Is chlorthalidone better than hydrochlorothiazide in reducing cardiovascular events in hypertensives?". Curr. Opin. Cardiol. 28 (4): 426–32. doi:10.1097/HCO.0b013e3283622075. PMID 23736816. ^ a b Duarte JD, Cooper-DeHoff RM (June 2010). "Mechanisms for blood pressure lowering and metabolic effects of thiazide and thiazide-like diuretics". Expert Rev Cardiovasc Ther. 8 (6): 793–802. doi:10.1586/erc.10.27. PMC 2904515. PMID 20528637. ^ Ravina, Enrique (2011). The evolution of drug discovery: from traditional medicines to modern drugs (1 ed.). Weinheim: Wiley-VCH. p. 74. ISBN 9783527326693. Archived from the original on 2015-01-10. ^ "Best drugs to treat high blood pressure The least expensive medications may be the best for many people". November 2014. Archived from the original on 3 January 2015. Retrieved 10 January 2015. ^ name=Roush2013> Roush GC, Buddharaju V, Ernst ME (July 2013). "Is chlorthalidone better than hydrochlorothiazide in reducing cardiovascular events in hypertensives?". Curr. Opin. Cardiol. 28 (4): 426–32. doi:10.1097/HCO.0b013e3283622075. PMID 23736816. ^ Messerli, Franz; Makani, Harikrishna; Benjo, Alexandre; Romero, Jorge; Alviar, Carlos; Bangalore, Sripal (2011). "Antihypertensive Efficacy of Hydrochlorothiazide as Evaluated by Ambulatory Blood Pressure Monitoring: A Meta-Analysis of Randomized Trials". Journal of the American College of Cardiology. 57 (5): 590–600. doi:10.1016/j.jacc.2010.07.053. ^ name=Ernst> Ernst ME, Carter BL, Zheng S, Grimm RH (April 2010). "Meta-analysis of dose-response characteristics of hydrochlorothiazide and chlorthalidone: effects on systolic blood pressure and potassium". Am. J. Hypertens. 23 (4): 440–6. doi:10.1038/ajh.2010.1. PMID 20111008. ^ Olde Engberink RH, Frenkel WJ, van den Bogaard B, Brewster LM, Vogt L, van den Born BJ (May 2015). "Effects of thiazide-type and thiazide-like diuretics on cardiovascular events and mortality: systematic review and meta-analysis". Hypertension. 65 (5): 1033–40. doi:10.1161/HYPERTENSIONAHA.114.05122. PMID 25733241. ^ Mitchell, Deborah. "Long-Term Follow-Up of Patients with Hypoparathyroidism". J Clin Endocrin Metab. Endocrine Society. Retrieved 19 June 2013. ^ Dvorak MM, De Joussineau C, Carter DH, et al. (2007). "Thiazide diuretics directly induce osteoblast differentiation and mineralized nodule formation by targeting a NaCl cotransporter in bone". J. Am. Soc. Nephrol. 18 (9): 2509–16. doi:10.1681/ASN.2007030348. PMC 2216427. PMID 17656470. ^ Johnson, KK; Green, DL; Rife, JP; Limon, L (February 2005). "Sulfonamide cross-reactivity: fact or fiction?". The Annals of Pharmacotherapy. 39 (2): 290–301. doi:10.1345/aph.1E350. PMID 15644481. ^ "Triamterene and Hydrochlorothiazide" Archived 2011-12-23 at the Wayback Machine. MedlinePlus. U.S. National Library of Medicine. National Institutes of Health. September 1, 2008. ^ "Prohibited List" (PDF). World Anti-Doping Agency. January 2018.